When the paths of Chinese entrepreneur Mr Jack Ma and respected Novocastrian, the late Mr Ken Morley, crossed almost four decades ago, the encounter formed a lifelong friendship and shaped the teenage Jack Ma’s life journey. This week, a group of University of Newcastle students, the historic first cohort of Ma & Morley Scholars, are in China for an immersion experience, designed to emulate the eye-opening encounter Jack Ma had when he visited Newcastle for the first time. 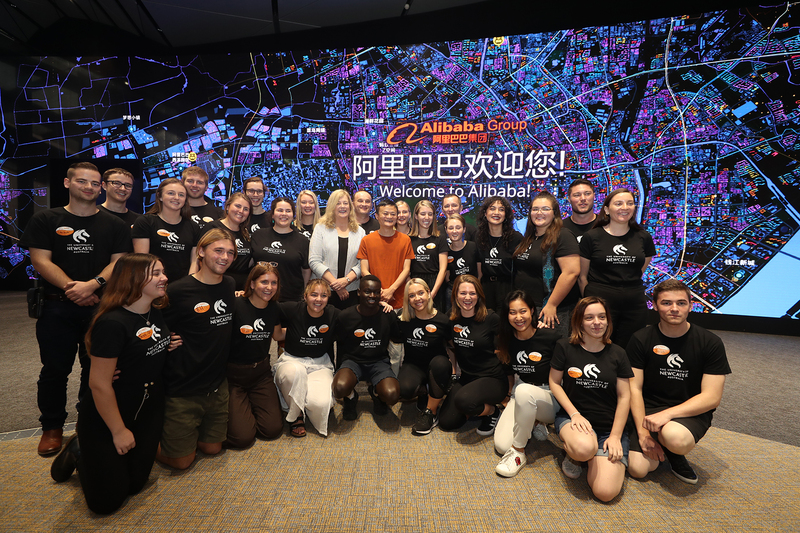 The unique $26million Ma & Morley Scholarship Program is the life-changing initiative made possible by the generous philanthropic support of the Alibaba founder and executive chairman, through the Jack Ma Foundation, the foundation’s first contribution in Australia. The program is unique to the Australian higher education sector, as the scholarship goes beyond the financial support of each student, also providing a comprehensive personal engagement and enrichment program to develop key networks and friendships, as well as experience important practical training to equip them for leadership in the global environment. The group of 30 scholars travelled to Shanghai on 23 June for their immersion experience, which will include 11 days visiting notable locations such as the Great Wall of China, Tiananmen Square, The Palace Museum, West Lake, Hangzhou Normal University Yuhung District Campus, and Mr Ma’s new entrepreneurial school, Hupan University. While in China, the scholars experienced a full day at the Alibaba headquarters on 27 June, which incorporated an invaluable meeting with Jack Ma. Vice-Chancellor, Professor Caroline McMillen, said it was heart-warming to witness Mr Ma’s incredibly selfless, and fitting tribute to his friendship with Mr Morley, unfolding. “The origins of the Ma & Morley Scholarship Program are built on some of the most basic of human needs – love and friendship,” Professor McMillen said. Mr Ma first met the Morley family when they were on a tour with the Australia-China Friendship Society in Mr Ma’s hometown, Hangzhou, China. Mr Ma was an enterprising teenager who would seek out tourists to practise his English. Mr Morley went on to become a highly influential figure in his life, instilling core values and a global perspective that positively impacted Mr Ma’s future and formed the bedrock of his entrepreneurial success and philanthropic endeavours. “Our Ma & Morley Scholars were chosen based on their potential to uphold the program’s values and create positive change in the world,” Professor McMillen said. The first cohort of Ma & Morley Scholars, includes 20 first year students chosen following a highly competitive and rigorous process from three selection categories, including Indigenous; educational disadvantage; or academic excellence. Each scholar will receive financial assistance over the course of their degree, participate in an enrichment program tailored to their aspirations, and join a network of influential leaders and change-makers. In addition, 10 current students are participating in the enrichment program and joining the group for the immersion experience. The Ma & Morley Scholarship Program application process was designed so that a diversity of students have a fair opportunity to access the life-changing experience. Half of the commencing Ma & Morley scholarships have been allocated to students who have completed or will complete a University of Newcastle enabling pathway like Newstep, Yapug and Open Foundation, echoing the university’s commitment to providing excellence and equitable access to education to people with ability and determination.